Food is delicious but not great! similar dishes like other reputable restaurants... maybe expected too much because it wasSo Hard to get reservation at this place! Good intentions but poor service. The atmosphere was stressed due to lack of staffing. Throughout the dinner, staff was unable to anticipate and meet the needs of the client, such as failure to refill water or to properly take down the client’s dietary needs before rushing back to the kitchen. There was a lack of respect for the experience and art form of the cuisine, displayed by the waiter’s okay for presenting a fallen desert and calling it “the same.” Food was wonderful, but the service was inadequate for the art form of the food. High quality ingredients and highly original way of cooking. Tasty and highly satisfactory. 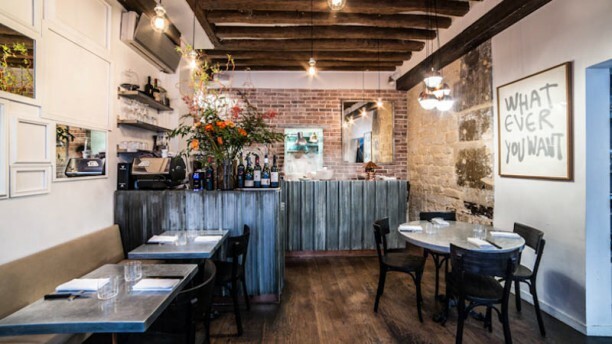 Best restaurant in Paris. That’s all. We just had a wonderful meal. The atmosphere,the service, the conviviality and value were top notch. The wait staff was super friendly and the wine list pricing was very reasonable. All this in the middle of Paris cannot be beat. Our highest rating. I believe here is best in Paris. Thank you all guys in the restaurant. Amazing food! Service was good but could be improved. At the beginning of the meal, we informed them that we had to leave by 8pm to catch the train to London and if food could be served quicker. They said they will try their best but there was a pretty long wait between each dishes and at 8.20pm our desserts were still not served and had to leave then. It was unfortunate to miss out on the dessert after enjoying all the other dishes. Not sure when we’ll be back in Paris again but will be back when we have more time in the future. A wonderful set menu comprising five small courses plus a couple of amuse-bouches. Dishes ranged from mussels to fois gras to straw ice-cream: a taste sensation! Portions were just right; we were neither too full nor hungry leaving, and had that wonderful contented feeling. This restaurant does only one sitting per evening, from 6,30pm to about 8.30pm. In fact, it is closed until that point, and all diners enter at around the same time. This actually creates a nice sense of shared experience, as everyone is eating the same thing at more or less the same time. Wines were perfectly selected, and reasonably priced. Overall, highly recommended, but book well in advance! We had a lunch menu, 3 dishes , around 50 euros. The taste so good, with beautiful figures. All staffs were friendly and smile, overall atmosphere so nice. I recommend you to try this restaurant. The best meal we ever had. Great service, fun and mellow vibe, sweet music mix. The finest cuisine without the stuffy attitude. Small, yet comfortable inside. A must-go in Paris! Small but really creative menu and precision around each ingredient - we sat at bar and watched each plate being prepped carefully. Gourmet/gastro without being too fancy. Went for lunch - two dishes in each section (plat/entree/dessert) so took all between the two of us. Fun way to try it all. Service was very personalized and attentive. Ambiance is simple. Good experience overall. One of my favourites! Kind staff! So many courses, all of them fabulous, but still not an overwhelming amount of food. Charming hosts, a casual but glowing atmosphere. Just the best. Consistently good and innovative. Haute cuisine at less than haute cuisine price.